For the few of you who don't already know, this is a follow-up to a fantasy action/comedy from the 90's. The entire cast is the same, and so is the general mood of the show. Lina inverse, our, uh, heroine, is a chaotic greedy aligned sorceress who turns reluctant good under dire circumstances. Her primary hobby is exterminating bandits and taking their treasure, because it's not stealing if you take it from thieves. The show is capable of switching gears from light and silly to dark and serious at a moment's notice, and it does so flawlessly. The characters are consistent and well-acted, and it is overall just a fun show. What can I say? It's Slayers! The Slayers Movie was one of (if not the) first anime I ever watched, as a teenager back in the 90s. I eventually saw the entire series and loved it (even TRY, which was pretty ridiculous) and all the OVAs and movies I could find. I somehow missed this series and was shocked to see it on CR. Naturally I had to watch it right away, and I was not disappointed. It is the same mix of ridiculous, quirky, silly, and serious that I remember. I am slightly sad that this is it, though. I always wanted to see Luna Inverse, and to see Naga and Lina reunite (and Naga meet Amelia). Evolution-R teases that big time with "Nama", but it isn't quite the same thing. As much fun as this addition to the series is, it does not do anything particularly new. And the ending honestly did feel a little lackluster after all the buildup. Nevertheless it was interesting. And it was more Slayers. If you love Slayers you will enjoy this. If you haven't seen anything else of Slayers, you could honestly still watch this and probably even enjoy it, but there are a lot of references to the earlier works (including a large portion of the main plot). So do yourself a favor and go find/watch the rest of the series first, it is well worth it. God the return to Adventure! 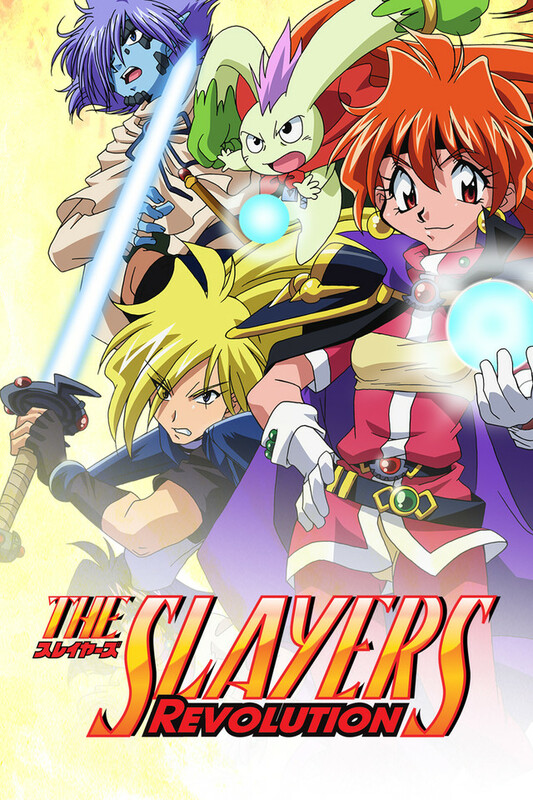 Man I grew up on Slayers and I have to say after try I was hungry for so much more... fast forward 10 years I hear about a reboot Slayers: Meet Again... see that it never gets off the ground to only find this was it's replacement... I suggest looking at the opening for meet again on youtube it's almost the same art. I love Revo and Evo-R they are fine additions to the series and keep the spirit of this anime alive. A great continuation of my favorite Fantasy/Adventure series! Slayers as a whole is a wonderful, silly, wild ride of excitement and laughs. Not only that, they were making fun of cliches before it was cool. I hope they continue the series beyond this. The one thing which will strike you immediately upon watching this series is how good the openings are. Every slayers series has an amazing opening which will really get you pumped for the episode. If you haven't seen the movies or the original three series/seasons (They function as independent stories but are cohesive. Not sure what to call them) you should watch them before watching this. You won't regret it! I've been watching anime since the 80's this is a series I used to own on VHS i do have the entire series on DVD now I bought all of it at once and spent a weekend rewatching it and it was just as fun and entertaining as I remembered it was it is a comedy with some serious moments thrown in and I think its a must watch for anime fans who haven't seen it. I highly recommend it gave a high 5 here and a 9 on a 1to10 scale for the entire anime please check out the earlier seasons first if you can don't know why their not on here. This entire series has an excellent dub even tho this one was made 10yrs after the original series they brought back the original voice over cast for this one and they didn't miss a beat. The entire series is available on Funimation.